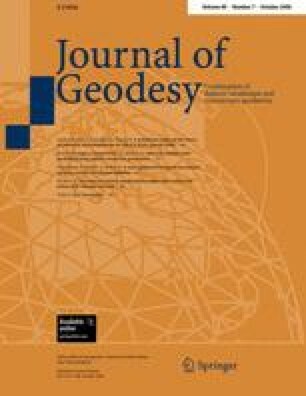 The EUREF [International Association of Geodesy (IAG) Reference Frame Sub-Commission for Europe] network of continuously operating GPS stations (EPN) was primarily established for reference frame maintenance, and also plays an important role for geodynamical research in Europe. The main objective of this paper is to obtain an independent homogeneous time series of the EPN station coordinates, which is also available in SINEX format. A new combined solution of the EPN station coordinates was computed. The combination was performed independently for every week, in three steps: (1) the stated constraints on the coordinates were removed from the individual solutions of the Analysis Centers; (2) the de-constrained solutions were aligned to ITRF2000; (3) the resulting solutions were combined using the Helmert blocking technique. All the data from GPS weeks 900 to 1302 (April 1997–December 2004) were used. We investigated in detail the behavior of the transformation parameters aligning the new combined solution to ITRF2000. In general, the time series of the transformation parameters show a good stability in time although small systematic effects can be seen, most likely caused by station instabilities. A comparison of the new combined solution to the official EUREF weekly combined solution is also presented.